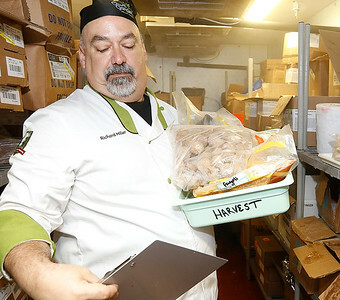 H. Rick Bamman - hbamman@shawmedia.com Olive Garden general manager Richard Miller prepares to inventory Tuesday, Aug. 2, 2016 the extra frozen food donated to the Wonder Lake Food Pantry. The McHenry location has donated more than 29,400 pounds of food since they opened in 2009. Olive Garden general manager Richard Miller prepares to inventory Tuesday, Aug. 2, 2016 the extra frozen food donated to the Wonder Lake Food Pantry. The McHenry location has donated more than 29,400 pounds of food since they opened in 2009.